I was only 14 when I asked my Dad if I could join the 21e, he would be paying my membership fee anyway. My friend Anthony had seen the 21e at Sheffield Triples and he wanted me to join with him. After a few weeks my letter arrived from Chris Durkin welcoming me to the regiment. I also received one in what looked like Arabic from the C.O. Dr Perko, well, I couldn't read it. We had both arranged to go to Audley End House, Saffron Waldon and we would be picked up by Duncan Tarry and Ian Matthews. When they arrived we were all introduced and started to pack our things in the most embarrassing Orange Skoda. We arrived at Saffron Waldon in the dark. It was a rather damp dewy evening but not too cold, I was glad because Anthony had convinced me to bring only one blanket, how I was to suffer. After pitching our tent in the dark we were introduced by Duncan and Ian to other members of the Regiment, nice people but I could hardly see them. After shivering the night through with only one flipping blanket I felt like violently stabbing him (Anthony). We set about making our breakfast on our little camping burners. I had never done this before so when my beans caught fire I thought all would take pity. Not a chance! The loudest heckles came from Michael and Richard Ransome, their Dad John, still never lets me forget. After our gourmet meall was introduced to Chris and Sue Durkin, little did I know that Susan would become like a mother to me and sadly a friend missed, her untimely death would rob us all of a fantastic person. Certain things were different in those days in the 21 eme, the members of the Medical team didn't take part in the Regimental Drill so I spent time getting to know the other members and the W.A.G.S. Anyway the time came for my first Battle and this would be the beginning of many a long hot marches to the field of Battle. 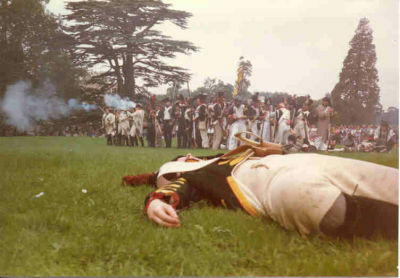 When the regiment opened fire I couldn't believe the smoke produced and when it fills your lungs for the first time, you don't half feel healthy. The fusiliers marched forward to the beat of the drum, the British lines opened fire and the regiment fell back with possibly too many casualties especially for a certain young infirmier I can remember trying to help a giant of a man to rear for his own blood soaked bandage, we probably looked like circus freaks -the midget and the giant. After more volleys and more advances the French were victorious and cries of 'Vive l'Emperor' rang all around the field and many Boo's from the crowd. The march back to the campsite, being on the winning side felt fantastic. The whole morning beans saga must have made the sapper, Mike take pity on me as he made us a lovely stew for tea. I have always felt good about the friendship of the 21 erne and the fact we make all feel welcome and part of the whole setup -May it continue. 1793 Landau, siege until 28th December. 1794 At Nice, General Kellerman formed a Polish battalion with men found in the 21eme demi-brigade, 9 companies of 3 officers and 70 men. 1796 Evening, Massena's division (21e) along left bank of the Ellero, from Mondovi to the Tanaro. 1800 Pas de Suse, and town of Suse. 1801 Battalion expeditionnaire formed on the Ile de Re, with 140 of the 21eme, 106 56th Line, 59 5th Light, 58 Colonial depot Ile de re, 28 legion Loire, 119 cannoniers 5th Foot artillery, on the frigate l'Africaine. 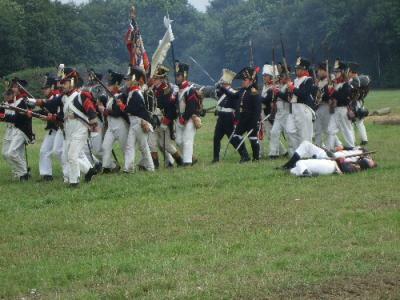 1803 Bruges Camp/Ostend, 3/4 battalions Flessigne until July 1804. 1804 3rd and 4th battalions to Cologne. 1805 Crossed the Danube at Pressberg, one battalion at Bruick, other in villages of Regelbrun, Arbestal, Collesbrunn, Willfersnauer, and Schadendorf, until 5th January 1806. 1807 Division at the Hohenstein camp until 5th June. 1813 Order to form 1st Corps, 1st division, 33rd Provisional demi-brigade (2/12, 2/21) forming near Erfurth, united into corps at Wittenberg. 1815 Between Quatre-Bras and Waterloo. Boulogne 1991 on the Video page.